Posted on Friday, August 6th, 2010 at 11:03 am. Small paper megaphones will be made by the general public. Posters will be printed with a template for the megaphone form and a space for people to write a statement they wish to shout or whisper. Alongside the public making workshop, Futurefarmers + core group will be building a large, mobile multiple person megaphone. And come to the 01SJ Biennial in September for more Futurefarmers’ Sunshine Still / Speak Hard. Posted on Wednesday, September 30th, 2009 at 10:37 pm. AndrÃ©a Stanislav, Ghost Siege, 2009, 70 ft L x 70 ft W x 22 ft H, steel, nylon, sound. Socrates Sculpture Park, NYC, NY. Photo courtesy the artist. AndrÃ©a Stanislav’s Ghost Siege opened Sunday, September, 13th at Socrates Sculpture Park, NYC, NY as part of the Emerging Artist Fellowship Exhibition. 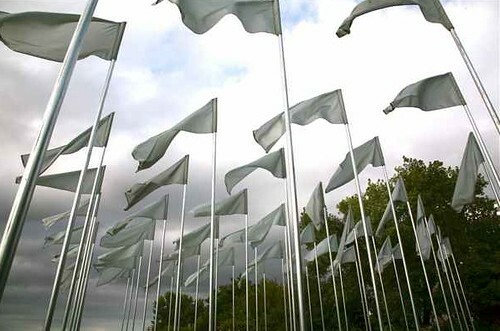 A site specific installation/formation of ghost flags comprised of 50 strategically located flag sculptures, made from reflective silver fabric, and steel flag poles. The flags have no markings or signifiers of conquest or elements of communication.Â Instead, the flags serve notice that the location has been conquered by time. Set within Ghost Siege, dancer/choreographer Leah Schrager will dance to music composed by Kenny Aronoff, preeminent drummer and percussionist. Ghost Siege from Leah S on Vimeo. Each year, EAF artists are awarded a grant and a residency in the Park’s outdoor studio and are also provided with technical support and access to tools, materials and equipment to facilitate the production of new sculptures and installations for exhibition in the Park.Â The artists develop their projects throughout the summer in the open studio and on site in the landscape, offering visitors the opportunity to experience both the creation and presentation of their works.Â Representing a broad range of materials, working methods and subject matter, the diverse sculptural works in this exhibition are presented against the Park’s spectacular waterfront view of the Manhattan skyline. Posted on Sunday, August 16th, 2009 at 9:44 pm. New media artists working across technology and mobility that can change habits and inhabitation of public spaces. digital/interactive/network media and technology based arts practice. Starting dates from January to December 2010 for two to five months. The AiR budget includes fees, accommodation, transport, production-costs, presentation and publicity. Posted on Wednesday, July 8th, 2009 at 12:12 pm. The timeframe for applications is short – due August 3 – but the opportunity for a residency and technical support to produce a new work to be shown at the 2010 01SJ Biennial, the 2011 Sundance Festival, and the 2011 Banff Summer Arts Festvial is enormous. Please distribute widely. San Jose, Calif. â€“ July 8, 2009 â€•The Banff New Media Institute at The Banff Centre, ZER01: The Art and Technology Network, and Sundance Institute’s New Frontier initiative today announced the formation of The Locative Cinema Commission, a joint venture to stimulate and showcase the creation of a locative cinema project. The Commission is presently soliciting proposals. The chosen artist or artists will realize their proposed project during a residency at The Banff Centre, to be completed by July 2010. They will also receive a $4,500 (four-thousand five hundred dollar) commissioning fee, related production funds, and will present their work at the 2010 01SJ Biennial from September 15 – 19, the 2011 edition of New Frontier at the Sundance Film Festival from January 20-30, and the 2011 Banff Summer Arts Festival. The purpose of this commission is to use “locative cinema” as an apparatus through which artists can share their vision using place in ways that are both specific and generic, or at least transferable. The Commission understands the notion of “locative cinema” as a platform-agnostic apparatus through which artists share their vision of place. Any variation on how to present an artist’s work will be considered, from cell phones to the black box of the cinema, from mixed reality to street theatre, from GPS to handhelds, from distributed to ambient. Proposals will be evaluated on their ability to engage people using place as a key element of the experience. The chosen project will receive a $4,500 commissioning fee a residency in Banff with up to $5,000 in related costs, and technical support from the Banff New Media Institute. Reasonable presentation costs, including necessary travel, will also be covered. The final project will be presented in San Jose, California, Banff, Canada, and Park City, Utah, and therefore must be realizable in those locations. Proposals will be accepted until August 3, 2009, and must include a conceptual proposal describing the relationship of the project to the place, a technical proposal outlining the basic parameters of the project, and strategies for problem solving during the residency. Other requirements include a budget, list of collaborators, links to examples of related past work, and resumes of key personnel. More information and specific application details are available at http://zero1.org/01sj/LCcall. Posted on Tuesday, May 26th, 2009 at 12:52 pm. The City of San Jose’s Office of Cultural Affairs and Environmental Services Department (ESD) are seeking a “photographer-in-residence” to document the people, places and operations involved in the daily workings of the Environmental Services Department Storm Water, Water Pollution Control and Water Recycling Services.Â The photographer-in-residence will spend approximately 20 hours per week documenting the Department’s work over a six month period and will be provided with a work station at the Water Pollution Control Plant, which will act as home base for this project. Â At the end of the residency period, the photographer will create a proposal for presenting the photographs (e.g. as a suite of framed photographs, web pages, a publication, etc.) and a separate production contract will be negotiated. Contact Information: Patricia Walsh, Public Art Program Coordinator, City of San Jose at patricia.walsh@sanjoseca.govÂ or 408.277.5144 extension 18. Posted on Wednesday, February 18th, 2009 at 9:02 am. Media artists, UK and beyond, are invited to apply for a three-week research residency at ISIS Arts, Newcastle Upon Tyne, UK between April to end of July 2009. Deadline for applications is Friday 20th March 2009. Artists are offered a self-contained city centre studio space, a fee of Â£1200 (to include travel and accommodation costs) and access to ISIS equipment and technical support. The emphasis for this residency is on research not on finished art work. ISIS Arts is an artist led, visual and media arts organisation with an international artist residency, commissions, training and research programme. Their programme seeks to address themes of identity and cultural understanding and they engage with artists to produce work that challenges and presents social issues within new contexts. ISIS has two studio spaces for visiting artists, a media training room, and an inflatable touring venue for sharing media arts with a wider audience. From their Newcastle base ISIS works with over 100 artists a year supporting practice and exchange. The ISIS Arts Research Residency programme started in 2005 and has included artists such as Joseph DeLappe (US), Mark Vernon (UK), Germaine Koh and Gordon Hicks (Canada), Monica Ross (UK), Kelly Richardson (UK, Canada), Francis Gomila (Germany), Jorn Ebner (Germany, UK). The ability to research, interpret and present ideas. Experience of using digital media in the creation of art works. Experience of working on fixed term residencies with deadlines. A professional practice, students not eligible. Please send your application to: ISIS Arts, 1st Floor, 5 Charlotte Square, Newcastle upon Tyne, NE1 4XF. Applications via email will also be accepted. For more information about this opportunity and application process please email isis@isisarts.org.uk or phone 0191 261 44 07. For more information on ISIS Arts please visit: www.isisarts.org.uk. Friday 20th March 2009.Selection will take place before end of March all applicants will be notified shortly after that. Equal Opportunities ISIS Arts seek to ensure that no present or potential member of staff or project participant is treated less favourably than another on grounds of age (up to statutory retirement age), class colour, disability, ethnic origin, gender, marital status, political persuasion or sexual orientation. ISIS Arts premises have limited access. However, we aim to ensure that as many of our activities are as accessible as possible. If you have any particular access needs, please contact us. This information is available in large print or alternative formats on request. Posted on Thursday, February 5th, 2009 at 11:42 am. Folly, a leading digital arts organisation, and Lanternhouse International are pleased to be seeking new applications for the Digital Artist Residency Scheme 2009. The scheme will be of particular interest to established digital artists seeking time and space to develop new works, research innovative ideas, make new connections and explore technique or production. Based at The National Creation Centre on the edge of the beautiful Lake District in Cumbria, UK, successful artists will be offered accommodation and a flexible and open-ended opportunity to push their work forward and creatively engage with the two partner organisations. We are seeking innovative and experimental artists who are naturally collaborative and interested in leaving a local legacy through participatory activity.